What if it's HP that wants nothing to do with Sprint? With the a Sprint Pre3 not looking likely to be, we’ve assumed for a while now that the blame lay with Sprint and that HP would want to have their phones on their webOS launch partner network. After all, Sprint is still home to a number of diehard webOS fans – nearly half of whom would be willing to dump the pin drop network to get webOS on AT&T or Verizon. There’s also just the idea of getting webOS phones on as many networks as possible, and thus into as many potential customer hands as possible. The thought was that Sprint sees themselves as having been burned by the Palm Pre launch. While the launch itself was a success for Sprint – the biggest launch in their history up to that point – sales and support afterwards didn’t live up to expectations. We’ve even heard from Sprint executives that they weren’t exactly happy with Palm or the Pre in the long haul. So there’s plenty of reason for Sprint to feel some notes of scorn towards HP and webOS. What if it’s Palm that felt burned by Sprint, and Sprint actually wants to carry the Pre3 in order to satisfy that eager webOS base? It runs contrary to how you might think about it, but it makes sense as an option if you think about it. Sprint shares a portion of the blame for the disappointment of the Pre as Palm. Carriers play a big role in the phone launch process, and between the advertising and quality and training there’s plenty of blame to go around. After the Pre launched, Sprint deliberately had Palm handicap the Pixi by removing Wi-Fi (which was added back in for the Verizon and AT&T Pixi Plus), and then took a pass on carrying both the Pre Plus and Pre 2. There have been plenty of anxious Sprint webOS users practically begging for a new webOS phone, and many of our readers (and this blogger) went through the process of hacking together a Sprint Pre Plus or Pre 2 of our own, in the process voiding the warranty of two phones and spending a good chunk of change just to have an up-to-date webOS experience on our network of choice. So the question still remains, is it Sprint that’s spurned HP, or HP that’s hating on Sprint? We’re starting to get the feeling it might be the latter more than the former (which we’re sure is going to kick up all sorts of dust in the comments – keep it civil, people). A few weeks ago when This is my next confirmed that the Pre3 would in fact not be coming to Sprint, they noted that their source said that “HP hasn’t planned any future devices for the carrier as of yet either.” We don’t know if this anonymous source is associated with HP or Sprint, but the news was a stab in the heart for the Sprint webOS fans. But there’s that wording – “HP hasn’t planned” – that started our wondering. It was a small voice nagging at the back of our mostly empty heads, but it wouldn’t go away. The nagging was kicked into high gear when one of our readers, a small business owner and Sprint subscriber, forwarded us a short but juicy email. He, like many other Sprint webOS fans, had emailed Sprint’s executive team looking for answers, or at least to let them know that he and his business really want a new generation of webOS. While the first response was from a concerned Bob Johnson, Sprint’s Chief Service Officer (in charge of Sprint’s customer experience, care, service, and repair), telling Mr. Source to expect a call from retention shortly. We’ll let that sink in for a minute. According to Mr. Elfman, it’s not Sprint that’s done with HP – it’s HP that’s done with Sprint. Somehow that hurts even more than thinking that Sprint was the burned party here. In HP’s choice to concentrate their efforts on getting new hardware and software out instead of trying to get webOS 2.0 running well on old hardware, they essentially abandoned the installed webOS userbase. In the quest for bigger marketshare, it appears that HP is taking the step of permanently abandoning a good portion of those users. As many have noted, their loyalty to Sprint is strong – nearly half in our poll were likely to stay with Sprint and use something other than webOS, or had already made the platform switch (and that’s among our webOS-centric readerbase). Verizon and AT&T are both significantly bigger than Sprint, and if AT&T’s proposed purchase of T-Mobile goes through, they will be even more so. HP under Mark Hurd and now under Leo Apotheker is striving for focus. webOS now has their massive negotiating power behind the platform and they no longer have to settle for getting by on a third-place carrier like Sprint. HP’s gunning for the big leagues here, and like it or not, that means leaving behind those in the minors that got them where they are. Sadly, that means customers as much as it means networks. On the flip side of that coin, it might not be wise to cut those ties when you haven't made the big leagues yet. HP might be the big dog in PCs, but they're not even a small player in the mobile space. That might change, but right now they need all the help they can get, and cutting off 12 million potential customers and a good chunk of your current webOS base isn't going to help. Even with HP's supposedly limitless resources, they don't have the luxury of being able to do everything at once. There's a reason Apple launched on just AT&T at first (and it's not just because Verizon laughed them out of the office) - they didn't have the experience with carriers that they do now. The business unit formerly known as Palm has plenty of experience with the carriers, but not a lot of weight. 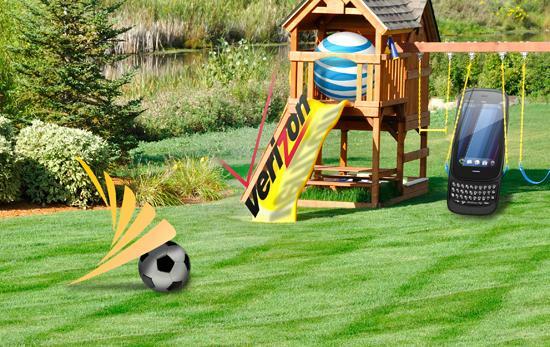 They have to pick and choose where to apply their efforts, and apparently that means networks other than Sprint.